October | 2011 | DEBtastic Reads! 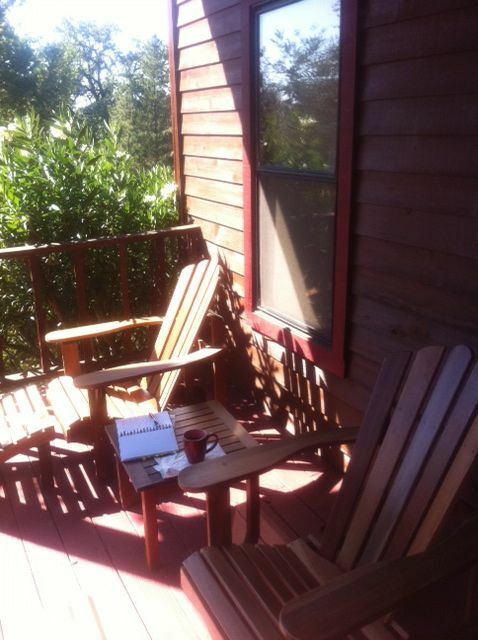 I’ve been on many writing retreats – ones where writers gather to work on their stories and later share with one another to offer encouragement and suggestions. I love going on them and am very productive. But, lately, I’d been craving a different kind of retreat. One where I do nothing but read. Why can’t I do that at home? Well, I can, but it’s challenging. My work-in-progress throws me neglected glances, dirty dishes and laundry beckon, errands call, Trixie (my dog) drops toys at my feet for me to throw. Distractions come at me and I willingly allow them to take me from my reading time. Plus, I feel a little guilty indulging in such pleasure when there are things to be done. 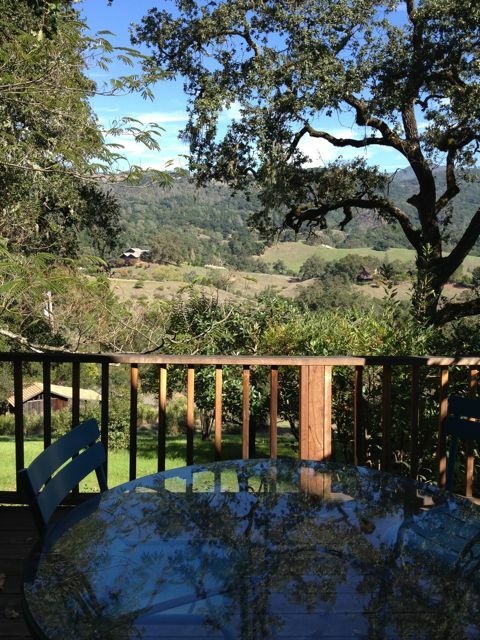 A generous friend offered me the use of her vacation home in Geyserville (about an hour and a half drive North of San Francisco), so I pounced on the opportunity to create a reading retreat afternoon. A like-minded book-loving friend and I drove up, shared a picnic lunch, and then settled into an afternoon of reading. The house is surrounded by lush hillsides covered with eucalyptus trees and grapevines. 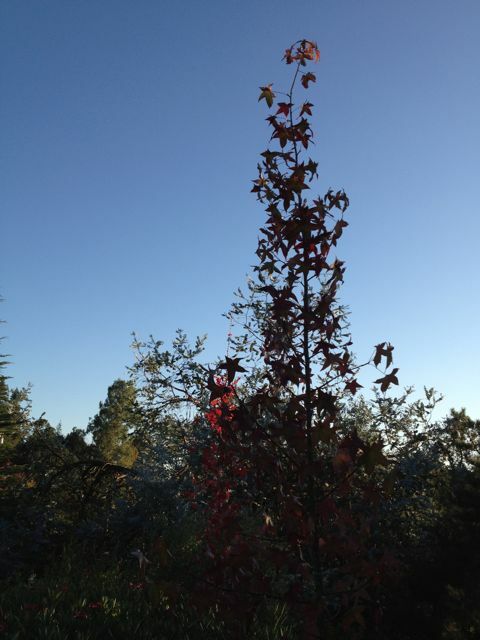 Birds chirped and crashed in the treetops, deer tread softly through the brush. The breeze was light, the sun was bright, the sky was blue, and the temps were fine. The most challenging task for the day was choosing where to sit. 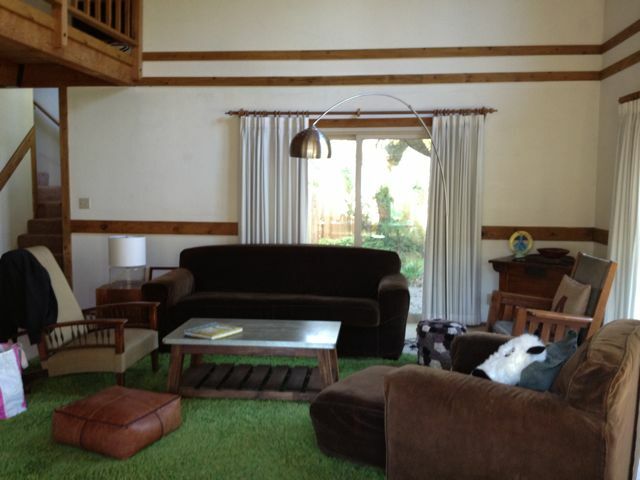 The living room with high ceilings (and a loft overlooking the room) contained cozy and inviting chairs. The back deck overlooked the hillside. The front porch (complete with deck chairs and a porch swing) was bathed in the sunlight. I started off flipping through a fun “journal” of Beatrix Potter, filled with photographs, drawings, and pull-out cards of letters and her writing. Then it was time for serious, sustained reading! We chose our separate reading corners, poured tea, and settled in for hours of uninterrupted reading time. It was blissful, serene, and relaxing! and I spent my reading time on the back deck. Hours flew by and too soon it was time to head home (after a lovely dinner in town). We’re definitely up for doing another reading retreat! We bid good-bye to our reading haven with promises to return as soon as we can. How about you? 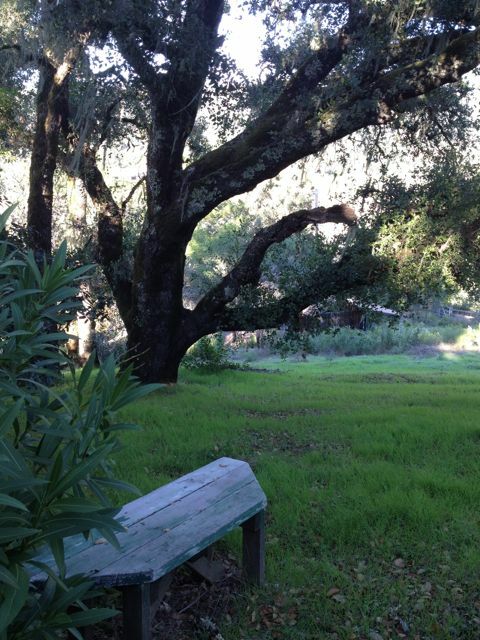 How does a reading retreat sound? Have you taken one before? Will you now? I would love to hear about it! Happy reading! Welcome back to Teatime Tuesday where I interview authors about their journeys to publication! Today I am thrilled to share my interview with Joseph Bruchac, author, poet, and storyteller. He’s written over seventy books for children and adults! I had the pleasure of meeting him many years ago, and remember him as being warm and kind. I’m excited to read his newest book! Keep reading for a fabulous description of his awesome writing space. What was your first published book and what was it about? My first published title, in 1971, was entitled Indian Mountain. It was a collection of my own original poems and a few translations I’d done of Ewe oral poetry while I was a volunteer teacher in Ghana. How long did your journey to publication take and what were the significant events along the way? I began trying to place my manuscript in 1969. It was rejected about 20 times before it was finally accepted by Ithaca House. Along the way I developed the habit of reading my rejected work each time it was returned to me as if it was written by someone else and I was an editor seeing it for the first time. That helped me greatly as I revised the manuscript and made it much better than it had originally been. Who/what were your sources of inspiration and how did they help you the most? My major sources of inspiration for that book and many of the others that followed–collections of traditional American Indian folk tales, novels, more books of poetry–were Native elders who shared their stories with me. I’ve been extremely fortunate throughout my life to have had the chance to listen to many people much older and wiser than me. I also drew then and continue to draw inspiration from the natural world–the animals and plants, the earth itself beneath my feet. 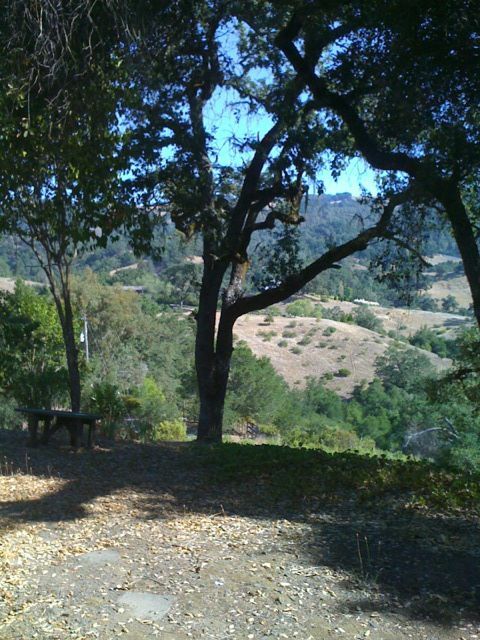 The experience of spending time alone, quietly, with nature is revitalizing and always brings me new insights. Do you have any rituals that you use when you’re writing? No rituals. I just sit down and start to write–either at my desk on my computer or in one of the notebooks I carry with me (not a notebook computer, a notebook with paper pages that I write on with a pencil). It could be early in the morning or late at night. I just try to write whenever I can find the time, though while I’m working on a big project I try to write every day during the morning for at least an hour. Describe your writing space. What makes it perfect for you? 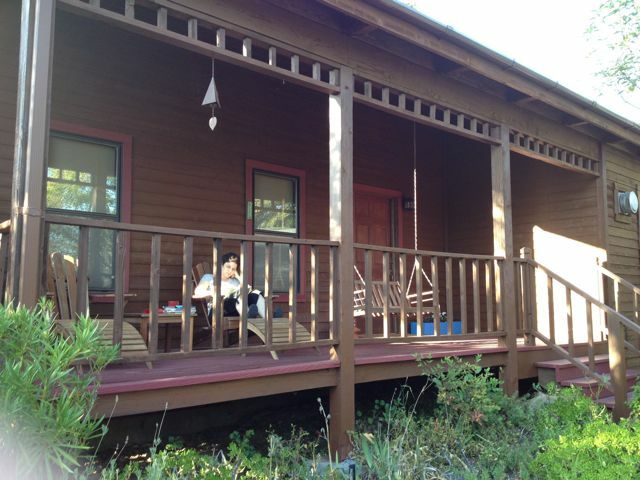 I have a small place, a 4 room cabin, that I retreat to each night. I’m away from e-mail (my computer there is not connected to the internet), phones, roads, and visitors. The walls of my study where I write are lined with bookshelves and I keep all the books there that relate to whatever I’m writing at the time. It’s at the end of a dead end road, next to a seven acre pond with hundreds of acres of wilderness beyond the 12 acres I own there. I can hear the wind in the trees and the sound of leaves falling to the earth and I’m visited often by deer, wild turkeys, and can find the tracks of bears and moose nearby, though they’re seldom seen. I think you can guess what makes it perfect for me. What is your most recently published book? What is it about? Check out this video interview of the author at Tu Books. Thanks, Joe, for stopping by! I loved Anna and the French Kiss by Stephanie Perkins for its fabulous setting (American boarding school in Paris) and gloriously tension-filled love story between Anna and St. Clair. When her second book came out, I pounced! Lola and the Boy Next Door was not a disappointment! Once again, Perkins artfully teases me with two characters who so obviously care about each other, but because of misunderstandings, a meddling twin sister, and bad timing, they can’t quite act on their feelings. This time, the story is set in San Francisco (my birth place!). The main character, Lola, age 17, knows that her boyfriend Max is “the one”! 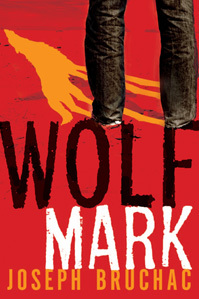 Unfortunately, neither her dads nor her best friend approve – Max is 22 and in an indie punk band. When the Bell twins move back in next door – Calliope, an up-and-coming ice skating champion, and Cricket, the boy who broke Lola’s heart – Lola is determined to ignore them. But Cricket makes that an impossible thing to do. Fans of the first book will be thrilled that Anna and St. Claire appear in this book! 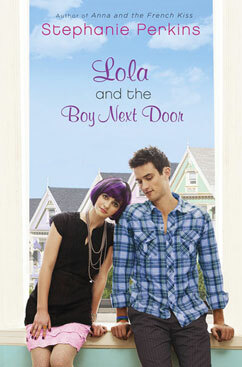 Lola and the Boy Next Door is another fabulous story about love and friendship. A definite reading rave! Speaking of reading – something I obviously love to do – I’m trying something new today. A friend and I are going on a reading retreat! I promise to blog about my experience next week, and maybe you would like to plan something similar! Last Thursday, I had the honor of hosting Greg R. Fishbone on his blog tour for his new middle grade novel, Galaxy Games. I held a drawing and one winner would receive a signed copy of his funtastic new book! 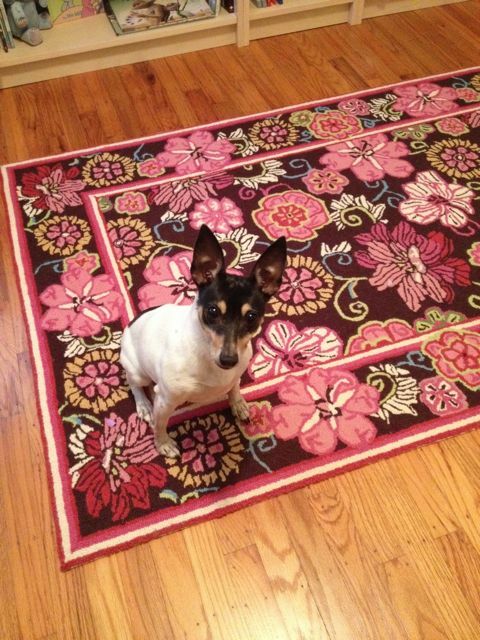 As always I called upon my rat terrier, Trixie, to choose the winner. The moment she hears crinkling paper, she comes running and awaits my instructions. 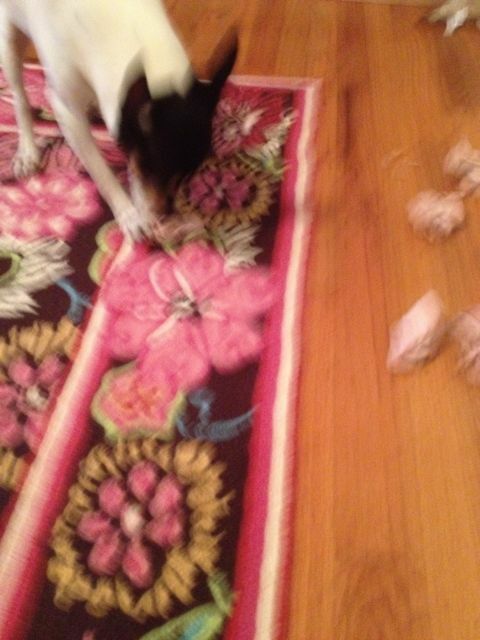 First, it’s “stay” while I placed the papers on the floor. When I say, “Okay!” she dashes over to the pile to pick a winner. She used to be better about releasing her prize, but today I had to pry it from her mouth before she shredded the paper. Sorry for the blurry picture, but I was trying to snap a shot while lunging for the paper. No worries, Trixie received a cookie as a treat! 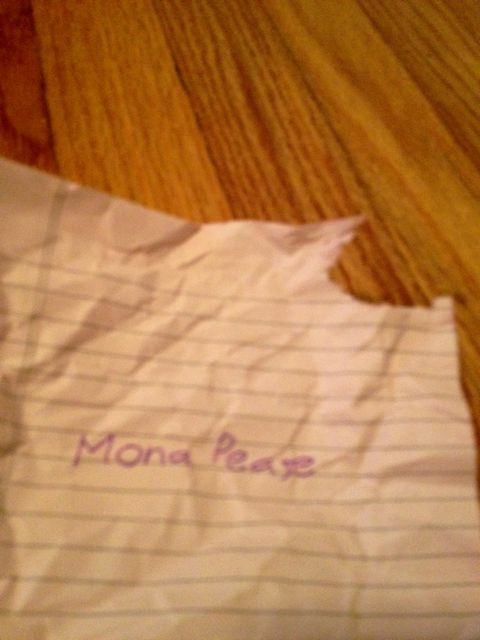 Mona Pease, come on down!!!! Congratulations on winning a copy of Galaxy Games: The Challengers! Please email me (see my contact info above) with your mailing address and your prize will be on its way to you shortly! Thanks to everyone who stopped by, and to those of you who entered the drawing. I promise there will be many more to come! Welcome to the Spotlight – Greg R. Fishbone! 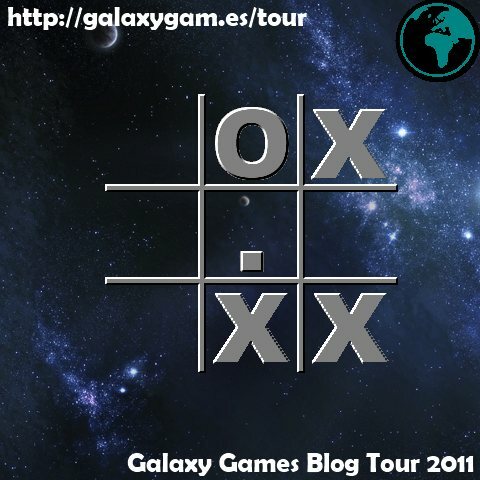 I’m so happy to take part in Greg R. Fishbone‘s blog tour for his new novel Galaxy Games: The Challengers! Stay tuned (see below) to find out how you can win a copy of his fantastically funny novel for middle-graders! Tyler Sato is thrilled to be celebrating his eleventh birthday. His relatives from Japan gift him with a star – naming it Ty Sato in his honor. When it’s discovered that Tyler’s star is not a star but a spaceship headed right for earth, Tyler’s eleventh year is sure to be a stellar one – or so he hopes! During the course of events, M’Frozza, the alien girl in the spaceship, introduces the Galaxy Games to Tyler and the globe – causing Very Important Events to occur for all of Earth. On the other side of the world, Tyler’s cousin Daiki has his own problems, including a judo champ (a girl!) who is desperate for a friend. I recommend this fun read to anyone who loves a story about friendship, space adventure, and intergalactic games! There’s great humor throughout – I laughed out loud many times! What was the initial spark for THE GALAXY GAMES? The initial spark came at a writing conference workshop run by an editor who works with series for middle grade boys. She challenged me to come up with a pitch for a sports series, on the spot, and present it to the rest of the group. My basic idea was to put the children of Earth up against children from other planets in the biggest and most important sports tournament of all time. That’s a series I would have loved to read myself when I was growing up, especially if it were packed with fun and adventure. It also had to be a multicultural series, because I wanted the Earth team to truly represent all of Earth. That original editor complimented my pitch and encouraged me to submit a proposal, but ultimately declined to publish it. It was a few years until Tu Books came into existence, responding to a need for more multicultural science fiction and fantasy books for young readers, and they really understood what I was trying to do. I laughed out loud more than a few times while reading your book. Do you have any advice on writing humor? Are you as funny off paper as on? I like to laugh and I think I have a pretty good sense of humor but I was never the class clown at my school. Actually, I’m more of a quiet introvert than anything else, but luckily you don’t have to be a stand-up comedian to write funny books. My advice to other authors would be to find things that make you laugh and try to figure out why those jokes work and how they can be even better. It’s about developing your own style rather than just repeating what you’ve heard or read elsewhere. You spent some time living in Japan. What is your favorite food memory while in Japan? 10. My apartment came with an electric rice-cooker! 9. One of the first useful Japanese sentences I learned was how to order a “Big Mac set” with no cheese and extra pickles for take-away. 7. Oden from the local street vendor. 6. That one restaurant with sushi plates that run on a conveyor belt past your table! 5. A vehicle that looked like it could have been an American ice cream truck, except that it sold roasted yams wrapped in newspaper. 4. The day I discovered that fried tako balls have octopus inside and were nothing like the Mexican-style tacos my mouth had been expecting. 3. A dozen varieties of Pocky! 2. Choosing between sports drinks called “Pocari Sweat” and “Post Water”. 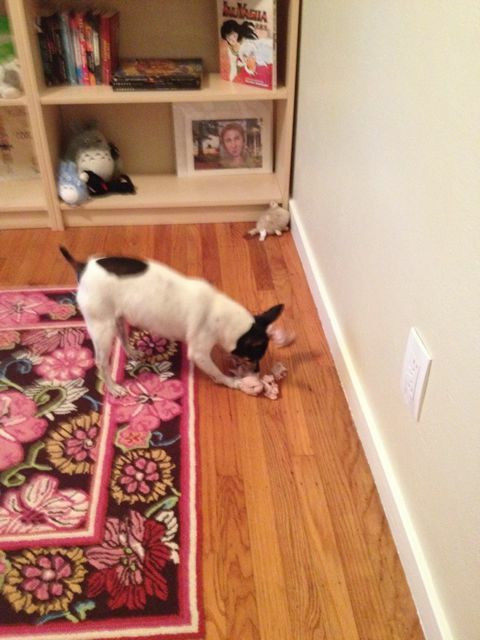 Note from Debbi: Okay, now I’m hungry! Greg Fishbone is an author of galactic fiction for young readers. He also serves as an Assistant Regional Advisor for the New England regions of the Society of Book Writers and Illustrators, is a two-time NESCBWI conference co-director, and founded of the Class of 2k7 debut author group. This summer he participated in the NASA and NSF-funded Launch Pad program at the University of Wyoming, intended to provide authors with better knowledge of astronomy and theories of science literacy. 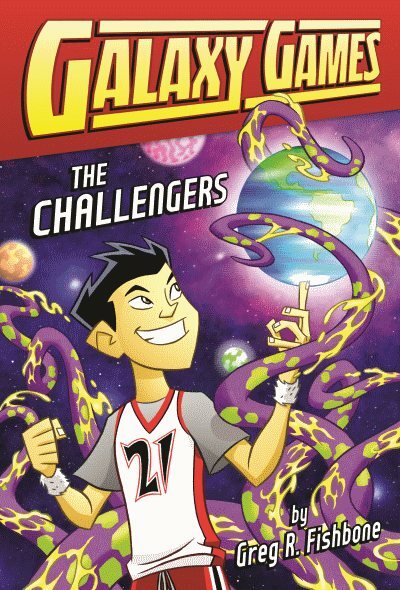 Now, how would you like to win a copy of Galaxy Games: The Challengers with a book plate autographed by the author himself? All you have to do leave a comment and you’ll be entered in a drawing. (LJ feed readers click here.) The only rules are that you must have a US mailing address and you must leave your comment by midnight PST Friday, October 14. The winner will be announced on Tuesday, October 18th. Good luck! Welcome to a new series I’m calling Teatime Tuesday where I’ll post my interviews with authors about their journeys to publication. Some of you might remember a similar series I did last year called Coffee Break Tuesdays. Because I’ve recently stopped drinking coffee (very shocking) and switched to tea, I’ve changed the title of this series and also changed some of the questions. I hope you enjoy this new series! Today I’d like to welcome author Liz Braswell. I’ve been a long-time fan of her books, reader of her blog, and though I’ve yet to meet her face-to-face (we hope to remedy that someday) , we’ve kept in touch via blogs and emails and I can assure you, she is one of the nicest and funniest people around! Snow (published under the name Tracy Lynn). It was a retelling of Snow White set in the 19th century with some steampunk (booya, before it was cool!) twists… The dwarves aren’t exactly dwarves, and Snow isn’t a dummy. That’s a hard one to date. From fourth grade or 1994, depending how you look at it. I was producing video games for Simon and Schuster’s interactive division and petitioned an editor there from day one to buy a book from me. It was more like day 2001, but still! Along the way I had my first short story published, in Amazing Stories magazine, and many more rejected. There was a teacher in my elementary school who took a group of us and had us make books, from start to finish. That was the first real feeling I had that I could WRITE. All of my other mentors were quasi imaginary: Lloyd Alexander, Deborah and James Howe, Roald Dahl, Rudyard Kipling… I read them, and wanted to be them. Coffee? Uh, no real ritual. I just write when I get a chance to write. With two small kids, I grab every chance I can, no time for rituals. Describe your writing space. What about it makes it perfect for you? Kitchen table. Balcony table. Upstairs on Alex’s homework table, hunched over. Bed. I think my ‘perfect’ space right now is a two-person table at Cafe Grumpy (Greenpoint!). I seem to write best when there is white noise–humming talk, nothing distracting–and absolutely nothing else I can do but work. Sometimes I even turn off my internets. Constant coffee (or genmaicha) also a bonus. When I need to sit and stare, the people walking by outside provide good visual white noise, although sometimes the hats that hipsters wear can be a little distracting. I have this near overwhelming urge to rush over and knock them off. What is your most recently published book or upcoming release? What is it about? 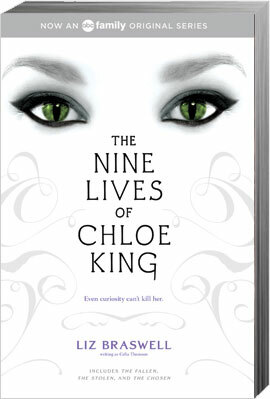 It’s not my most recently written, but the re-release of The Nine Lives of Chloe King 1-3 in conjunction with the TV show were the most recently published. It’s about a girl who turns 16 and develops cat powers. I’m working on a bunch of different stuff right now, coming soon to a publisher near you. Thanks, Liz, for stopping by! I have a several friends with whom I share reading tastes. Without fail, every book one of these friends recommends to me has been one I loved. It’s rare to find that kind of similarity in tastes with one friend, rarer still with several. Recently, one of those friends recommended a book that for some reason I resisted for a while. I’m not sure where that resistance came from because I’d read and liked other books by this author. Perhaps it was the blurb/summary, although I don’t have the book right now to check. In any case, it took well over a month, maybe two, before I picked up the book. Once I started reading, I didn’t want to put it down. Blink, after having run away from home to save himself, gets his meals by sneaking into hotels and eating leftovers on trays in hallways. One day, he gets a glimpse of what looks like a fake kidnapping, and learns much more after he’s able to get into the hotel room. Caution also runs away from home after a trauma and lives on the streets with a death wish. 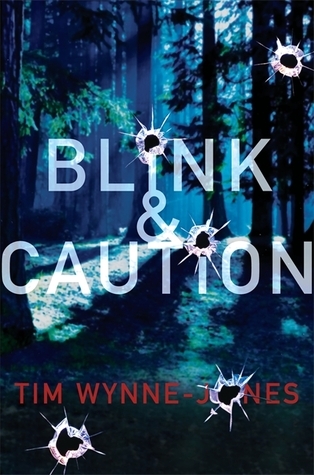 After escaping from her druggie boyfriend/captor, Caution tries to make her way somewhere/anywhere – and comes across Blink. Together they end up entangled in the possibly false kidnapping mystery, and as they learn to trust each other and rely upon each other, friendship blossoms. This sometimes bleak story has real hope – and the kind of ending I appreciate. But what if you have young children at home? Or a full time day job? You might want to try a Read At The Table Night as author Linda Urban does with her family. Every Tuesday night at her house, she sets out finger foods on the dinner table – cheeses, breads, and more. During dinner, each family member brings a book to the table and gets lost in his/her reading while noshing, nourishing both body and soul. 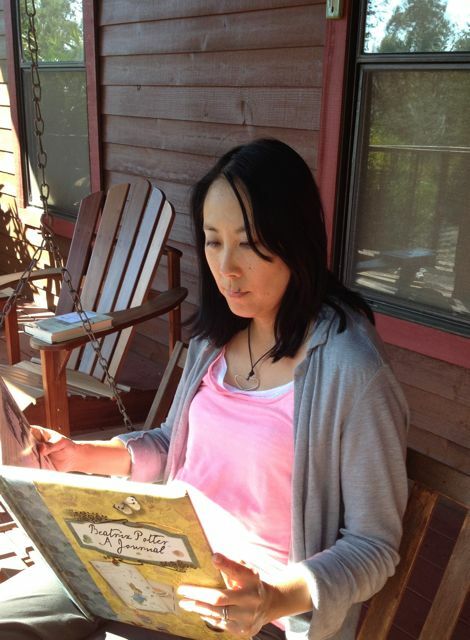 For more about her family reading habit, see her blog post which will lead you to an article she wrote for Book Hook. By the way, I highly recommend you subscribe to Book Hook, a newsletter that provides some fabulous reading recommendations! What are your reading habits? I’d love to hear them! 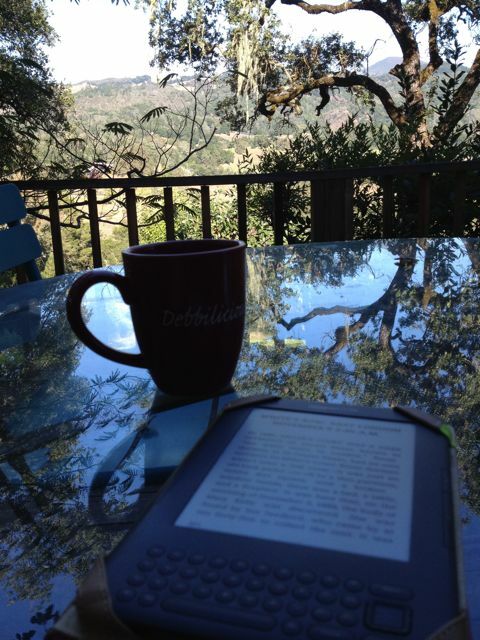 I’m in the process of setting up a reading retreat with a friend – an afternoon away with nothing to do but read. I’ll be blogging about the experience here later this month! PS – This is one of my favorite photos. 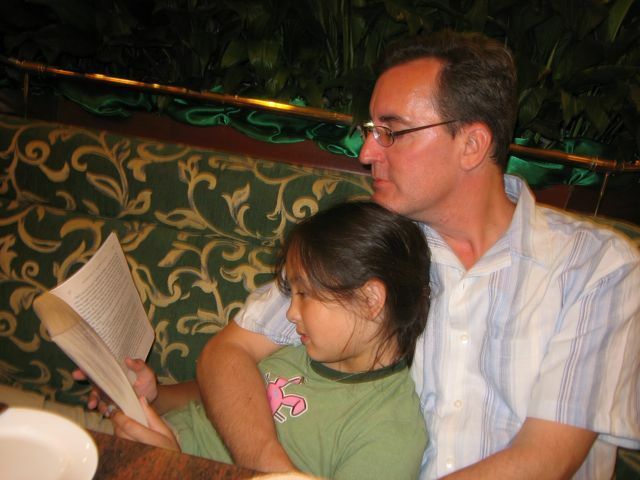 The summer my daughter was 11 years old, when we were living in Shanghai, she read the entire series (what was available then) of Harry Potter while we toured around China. She was never without a book in her hand. This is at a restaurant after a long day of touring, with my husband, Bob, looking over her shoulder.